Apple Fast Becoming iPod, Inc.
Why Won't Apple Let Me Use XSKN's iKeyboard with My iPhone? PR: Apple on Wednesday introduced the new iPod nano, adding a video camera, mic and speaker to the world's most popular music player. Music lovers can now shoot video wherever they are, view it on their iPod nano and use their computers to easily transfer their videos to YouTube. The new iPod nano features an ultra-thin and sleek design with a larger 2.2" color display and gorgeous polished aluminum and glass enclosure. iPod nano also features a built-in FM radio with live pause and iTunes Tagging, as well as a built-in pedometer. 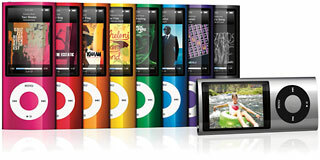 The new iPod nano is available today in an 8 GB model for $149 and a 16 GB model for $179, and comes in nine brilliant colors including silver, black, purple, blue, green, orange, yellow, (Product) Red and pink. iPod nano features a larger 2.2" display for easier navigating, enjoying album art, or shooting and viewing video clips. 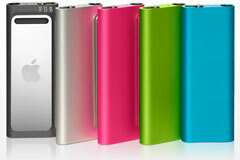 iPod nano is ultraportable so users can shoot video wherever they are, in either portrait or landscape. iPod nano customers can share videos instantly with friends using its display and speaker, or sync with a Mac or PC and share them on YouTube, MobileMe™, Facebook or via email. * iPod nano can even shoot videos with fun real-time effects such as Thermal, Film Grain, Kaleido and X-Ray. iPod is the world's most popular family of digital music players with over 220 million sold. Apple's new holiday lineup includes iPod shuffle in five great colors starting at just $59; iPod classic in a new 160 GB model holding up to 40,000 songs for $249; the new iPod nano with a video camera available in nine brilliant polished aluminum colors starting at $149; and the revolutionary iPod touch now starting at the breakthrough price of just $199. The new iPod nano is available immediately for a suggested price of $149 (US) for the 8 GB model and $179 (US) for the 16 GB model in silver, black, purple, blue, green, orange and pink through the Apple Store, Apple's retail stores and Apple Authorized Resellers. The 8 GB and 16 GB iPod nano in yellow and (Product) Red are available through the Apple Store and Apple's retail stores. iPod nano requires a Mac with a USB 2.0 port, Mac OS X v10.4.11 or later and iTunes 9; or a Windows PC with a USB 2.0 port and Windows Vista or Windows XP Home or Professional (Service Pack 3) or later and iTunes 9. PR: Apple on Wednesday announced the new iPod touch lineup starting at the breakthrough price of just $199, giving users a great iPod, a great pocket computer, a great game player and access to Apple's revolutionary App Store with over 75,000 applications. iPod touch features Apple's revolutionary Multi-Touch™ user interface, a gorgeous 3.5" widescreen glass display, WiFi, Bluetooth, and a built-in accelerometer and speaker - all in an amazingly thin metal design that slips easily into your pocket. The 8 GB iPod touch is now available for $199, along with new models which deliver twice the capacity for the same price, with the iPod touch 32 GB model for $299 and 64 GB model for $399. iPod touch is a great iPod for enjoying music, television shows, movies and podcasts. iPod touch has incredible features for music fans such as Cover Flow, Shake to Shuffle™, and access to the legendary iTunes Store. And now, the new iPod touch supports Genius Mixes, which automatically creates up to 12 endless mixes of songs from your iTunes library that go great together. Movies and television shows look great on the gorgeous 3.5" widescreen display. iPod touch customers have the entire iTunes Store catalog at their fingertips, giving them instant access to the world's largest catalog of over 11 million songs, TV shows and Hollywood movies to purchase and download directly to their iPod touch. iPod touch is a great game player with its built-in accelerometer, revolutionary Multi-Touch user interface, its amazing graphics performance and the over 20,000 game and entertainment titles available on the App Store. With support for peer-to-peer connections, the new iPod touch gives users the ability to play multiplayer games with people next to them or around the world. iPod touch customers can add new game titles from the App Store over WiFi anytime and anywhere. iPod touch is a great pocket computer, letting users surf the web, do email, manage their calendars, organize contacts, and use social networking sites such as Facebook and Twitter. With its award-winning Safari web browser, iPod touch users can experience the Internet like no other pocket-size device. iPod touch comes with the latest iPhone™ 3.1 software including: Cut, Copy and Paste; Spotlight Search to search across iPod touch or within Mail, Contacts, Calendar and iPod; landscape keyboard for Mail, Notes and Safari; remote lock for MobileMe™ and anti-phishing features. Apple's App Store is a phenomenal success with a selection of over 75,000 apps available and customer downloads topping a staggering 1.8 billion apps. iPhone and iPod touch customers in 77 countries can choose from an incredible range of apps in 20 categories, including games, business, news, sports, health, reference and travel. The App Store works with iPod touch over WiFi so users can discover, purchase and download apps wirelessly and start using them instantly. iPod touch features up to 30 hours of music playback or six hours of video playback on a single charge. The 8 GB model holds up to 1,750 songs, 10,000 photos and 10 hours of video; the 32 GB model holds up to 7,000 songs, 40,000 photos or 40 hours of video; and the 64 GB model holds up to 14,000 songs, 90,000 photos or 80 hours of video. * The 32 GB and 64 GB models also include up to 50 percent faster performance and support for even better graphics with Open GL ES 2.0.
iPod is the world's most popular family of digital music players with over 220 million sold. Apple's new holiday lineup includes iPod shuffle in five great colors starting at just $59; iPod classic in a new 160 GB model holding up to 40,000 songs for $249; the incredible new iPod nano with a video camera available in nine brilliant polished aluminum colors starting at $149; and the revolutionary iPod touch starting at the breakthrough price of just $199. The new iPod touch is available immediately for a suggested price of $199 (US) for the 8 GB model, $299 (US) for the 32 GB model and $399 (US) for the 64 GB model through the Apple Store, Apple's retail stores and Apple Authorized Resellers. iPod touch requires a Mac with a USB 2.0 port, Mac OS X v10.4.11 or later and iTunes 9; or a Windows PC with a USB 2.0 port and Windows Vista or Windows XP Home or Professional (Service Pack 3) or later and iTunes 9. Existing iPod touch users can update to the latest 3.1 software for just $4.95 (US) to enjoy new features including Genius Mixes and Genius for Apps. iPod touch owners who already have the 3.0 software get the 3.1 software update for free. Simply download the latest version of iTunes onto your Mac or PC, and purchase the 3.1 software update via iTunes. *Battery life and number of charge cycles vary by use and settings. See www.apple.com/batteries for more information. Music capacity is based on four minutes per song and 128-Kbps AAC encoding; photo capacity is based on iPod-viewable photos transferred from iTunes; and video capacity is based on H.264 1.5 Mbps video at 640-by-480 resolution. PR: Apple on Wednesday announced that iPod shuffle, the world's smallest music player and the first music player to talk to you, is now available starting at just $59 in five great colors. iPod shuffle's intuitive controls are conveniently located on the headphone cord, letting you navigate and enjoy music without even looking. With the press of a button, you can play, pause, adjust volume and switch playlists, plus the VoiceOver feature lets iPod shuffle speak song titles, artists and playlist names. The iPod shuffle is available worldwide today in a new 2 GB model for just $59 and a 4 GB model for $79, and both models come in silver, black, pink, blue and green. iPod shuffle is based on Apple's incredibly popular shuffle feature, which randomly selects songs from your music library. iPod shuffle features a sleek and ultra-wearable design with a built-in stainless steel clip. iPod shuffle users can easily clip it to almost anything and take it everywhere. The third generation iPod shuffle is available immediately for a suggested price of $59 (US) for the 2 GB model and $79 (US) for the 4 GB model in silver, black, pink, blue and green through the Apple Store, Apple's retail stores and Apple Authorized Resellers. A 4 GB special edition polished stainless steel model is available in a 4 GB model for $99 (US) through the Apple Store and Apple's retail stores. iPod shuffle comes with the Apple Earphones with Remote and the iPod shuffle USB cable. iPod shuffle requires a Mac with a USB 2.0 port, Mac OS X v10.4.11 or later and iTunes 9 or later; or a Windows PC with a USB 2.0 port and Windows Vista, Windows XP Home or Professional (Service Pack 3) or later. "This iPod employs copious amounts of glue and adhesive to hold everything together. That makes it easy for Apple to put together, but hard to take apart. We had to remove the camera bezel before we could start the disassembly. As expected, the main ARM processor dwarfs everything else on the board. Toshiba is the source for the 8 GB of flash memory. Our memory chips were made in Taiwan in July of this year. There is no space for a larger camera in the 6.2 mm thick iPod without reducing the size of other components. The speaker is very similar to the speaker in the iPod touch. The audio simply comes out the bottom of the iPod. The new 240x376 display boasts 17.5% more screen real estate than the previous model. The tolerances on this iPod are incredibly tight. There's no wasted space inside. Including the mount, the iPhone camera is thicker than the entire new iPod nano! Unlike the nano, the iPod touch could conceivably support an iPhone-sized camera, although it would certainly be an engineering challenge. "We'll be putting out a teardown of the new iPod touch and shuffle soon. "P.S. We've had a number of questions as to where we got our iPod. "Yes, we had to fly to the east coast to get it first. We sent our summer engineering intern." Fast Company's Chris Dannen says that back in 2007, when Apple dropped the "Computer" from its corporate title and become simply Apple, Inc., the change seemed semantic or aesthetic, depending on your outlook. However, as things have unfolded, he thinks the move may have been more prescient than it originally appeared, with Apple officially increasing the number of mobile devices it makes to a grand total of eight this week, which tallies up to one more iPod than Macintosh in their lineup. Apple, he says, seems to have become primarily a mobile device maker. Link: Apple Fast Becoming iPod, Inc.
"If you would like to learn how to watch movies on your TV that were downloaded to your iPhone, this video is for you." "I still can't believe Apple hasn't approved Bluetooth keyboard drivers for the iPhone, but that hasn't stopped user-hacks, or products lining up to be ready. This latest effort modifies actual Apple Bluetooth keyboards, and adds app icons to the keys." Link: Why Won't Apple Let Me Use XSKN's Bluetooth iKeyboard with My iPhone? With this free, user-friendly online tool, consumers can make informed decisions about which cell phones to buy. The EWG guide uses easy-to-read graphics to illustrate each phone's radio frequency emissions, enabling consumers to make quick comparisons of radiation output of various wireless devices. EWG has compiled the guide, based on technical data provided by manufacturers, to fill the information gap left by the US government's failure to require cell phone makers and vendors to disclose emissions levels on labels or in-store advertising displays. Public health officials' concerns about the possible dangers of radio frequency emissions are intensifying as wireless devices proliferate. According to the CTIA Wireless Association, an international industry group, US wireless subscribers numbered 270.3 million - 87 percent of Americans - as of December 2008, a 30 percent jump in three years. Some 60 percent of the global population - 4 billion people - subscribe to wireless services, according to Cellular News, an online global industry news outlet. Health agencies in six nations - Switzerland, Germany, Israel, France, the United Kingdom, and Finland - have issued warnings to limit cell phone use, particularly by children, whose softer, thinner skulls are less able to shield the brain from radiation. Scientists have found that children's brains absorb twice as much cell phone radiation as those of adults. EWG's analysis of possible public health risks of cell phone radiation culminates a 10-month investigation of more than 200 peer-reviewed studies, government advisories and industry documents. Our conclusion: current US cell phone radiation standards, set by the US Federal Communications Commission (FCC) and based largely on 1992 cell phone industry recommendations, are outdated and allow 20 times more radiation to penetrate the head than the rest of the body. "The first cell phones were marketed to adults," Naidenko said. "But today, children are just as likely to own a cell phone as a video game, baseball or bicycle." According to the Pew Internet and American Life Project, which tracks cell phone use among US children between 12 and 17 years old, last year (2008) 71 percent of tweens and teens owned cell phones. More than half use the device daily. EWG urges concerned consumers to take action and tell the federal government that cell phone makers should be required to disclose each phone's radiation output on the label. EWG's new interactive database, based on technical specifications of cell phones currently on the market and some popular older models, can be searched by model. 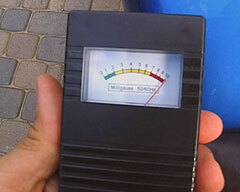 A separate database details radiation levels of smart phones. EWG is a nonprofit research organization headquartered in Washington, DC, with offices in Oakland, CA and Aimes, IA, that uses the power of information to protect human health and the environment. PR: Javelin Strategy & Research released a report indicating that mobile banking is quickly moving from a "techie" to mainstream capability that is changing how consumers manage their finances today, which in turn will change how consumers pay for goods in the future. The report, 2009 Mobile-Banking and Smartphone Forecast, examines services offered by carriers such as AT&T, Verizon, Sprint and T-Mobile. The report also features five-year forecasts for mobile-banking usage that documents the growing availability of mobile banking at everyday financial institutions. "Mobile banking is quickly moving from infancy to commonplace, which will help separate the winners from losers in banks' ability to attract and keep technology-loving consumers," said Mary Monahan, Research Director and Managing Partner. "Consumers are hungry for the 'always-on' and 'real time' ability to monitor and manage their money, and mobile banking serves that need better than any other." The Javelin report also covers general smartphone adoption, which is a secondary factor driving mobile banking, and the race to develop the basic thin-client capabilities that Javelin calls "wrapper applications" to integrate financial services into mobile online sites. 99 million US adults will conduct mobile banking transactions at least once per year by 2014 - with 52% of mobile-phone users relying on smartphones. Mobile banking will rival online banking, with the former used as a "remote control" and the latter as a detailed form of control panel for more complex transactions. AT&T has the highest number of mobile bankers due to the iPhone's influence, while Verizon Wireless has the lowest penetration for mobile bankers among the top tier US wireless carriers. "Mobile banking is quickly becoming an essential consumer capability," said Mark Schwanhausser, Financial Services Channels Analyst. "Just as the iPod changed the music industry and their business models, our data shows that iPhone users are changing the banking industry by leading the way in monitoring and managing finances through mobile devices." Javelin provides superior direction on key facts and forces that materially determine the success of customer-facing financial services, payments and security initiatives. Our advantages are rigorous process, independent position, and expert people. "The H1N1 Influenza, better known as the swine flu, is a real concern for just about everyone this year, making keeping up to date on the latest news paramount. "But considering we're all so busy, remembering to visit government Web sites can be difficult. Installing some basic apps onto your iPhone isn't. Check out some of these apps that will keep you abreast of all the latest news about the swine flu." "You can now edit Office 2007 docs and spreadsheets on your iPhone. "Today, Quickoffice rolled out a new version of its iPhone office app suite that handles .docx and .xlsx files produced by Microsoft Office 2007 for Windows and Office 2008 for Mac...."
"Imagine my giddy, girlish, giggle when I tried out Remote Buddy. The thrill is back, baby! . . . Remote Buddy is a Mac utility which lets your control anything on your Mac..."
PR: J. C. Penney Company, Inc. has launched a new app for Apple's iPhone - JCPenney Weekly Deals - bringing the retailer's signature style and affordable prices directly to customers' fingertips, whenever and wherever they need it. Find the nearest store to either their current location or to a zip code/city name. "With shoppers increasingly doing research before they step into a store, our new iPhone app is the latest way we are providing our customers an easier, more engaging and integrated shopping experience," said Mike Boylson, chief marketing officer for JCPenney. "Furthermore, with more than 13 million iPhone users in the US - along with 12 million iPod Touch users who can also download apps - the launch of an iPhone app allows us to share our style, quality and affordable prices each week with a rapidly growing base of consumers." The launch of the JCPenney Weekly Deals iPhone app builds on the Company's "Know Before You Go" initiative, developed based on extensive customer research which found that a large number of customers visiting jcp.com were online for a purpose other than shopping. An online survey of jcp.com customers showed that a significant majority of those surveyed were visiting the site to do some form of research: viewing merchandise, comparing prices, browsing sales and promotions, finding store directions, exploring ideas for fashion and home, and more. In response to these findings, innovative features were added to jcp.com - such as enhanced search capabilities and product information, merchandise availability at local stores, and the ability to view weekly sales circulars online - making shopping at JCPenney easier and more efficient than ever before. JCPenney is one of America's leading retailers, operating 1,106 department stores throughout the United States and Puerto Rico, as well as one of the largest apparel and home furnishing sites on the Internet, jcp.com, and the nation's largest general merchandise catalog business. Through these integrated channels, JCPenney offers a wide array of national, private and exclusive brands which reflect the Company's commitment to providing customers with style and quality at a smart price. Traded as "JCP" on the New York Stock Exchange, the Company posted revenue of $18.5 billion in 2008 and is executing its strategic plan to be the growth leader in the retail industry. Key to this strategy is JCPenney's "Every Day Matters" brand positioning, intended to generate deeper, more emotionally driven relationships with customers by fully engaging the Company's approximately 150,000 Associates to offer encouragement, provide ideas and inspire customers every time they shop with JCPenney. Africare, the largest and oldest US development organization focused solely on Africa, has launched an exciting new marketing campaign Pass It On! to highlight stories of people overcoming major issues on the African continent, issues such as unsafe drinking water, food insecurity, and the growing number of children orphaned by AIDS. Taking an integrated approach, Pass It On! combines traditional Washington, DC, king size bus posters and backlit Metro dioramas with "viral" social media such as Facebook, YouTube, Twitter and the internet, along with one of the very first iPhone applications approved for non-profits. According to Beth Eisenberg, vice president of Business Development at iugo, the developers of Africare's application, "When a nonprofit needs support, it needs to connect to its supporters. The key is to find something that costs nothing for the supporter to embrace a cause they care about - just their time and curiosity. The Africare iPhone app & does just that!" Among its many features, the application includes a photo gallery, video and a "Click to Donate" button, from which a person can use his or her phone bill to contribute. To date, only three such applications have been created. The Pass It On! campaign will use the new iPhone app to promote 16 featured individuals who are ready to tell you their story in a format that is ready to "pass on" to a friend or someone you know through video, social networks, e-mail and many handheld devices. The stories range from the first female auto mechanic in Niger to a farmer overcoming desert conditions to grow food for his family to a group of women in Senegal who make dolls to support their health services devastated by 25 years of conflict all through partnerships with Africare. Trudi Rishikof, Africare Director of Communications and Marketing, noted the importance of reaching out as broadly as possible: "These are tight economic times for Americans and others around the world, but people still want to help those in need. Through this new iPhone app and the other social networks, it's easy to give $5 and perhaps skip that extra latté. Lots of people giving small amounts adds up to significant support for Africare's work, especially since 93 cents of every dollar goes directly to programs. We are grateful for every gift." 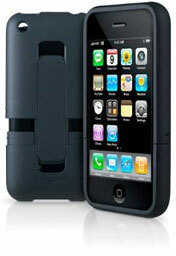 PR: Marware Inc. has announced the SportShell for iPhone 3G/3GS is now shipping. The SportShell provides exceptional protection and a sleek look. This low-profile case offers three distinct carrying solutions. Using a unique, patent-pending design, the SportShell easily changes from belt-clip case to an ultra slim, flat-back or open-back case. The ratchet belt clip rotates a full 360-degrees, and doubles as a tabletop stand. The flat-back option is ideal when carrying the iPhone in a pocket or purse. The open-back option displays the iPhone's Apple logo. The SportShell comes with Marware's Lifetime Warranty. The SportShell is available in black, retails for $34.99. The Sportshell is available online and is now shipping. Please visit Marware for additional information. 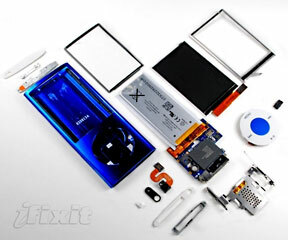 Marware is a leading provider of software and accessory solutions for Apple iPhones, iPods, and Notebooks.